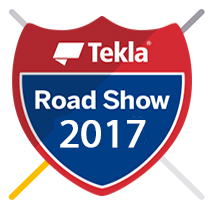 The 2017 Tekla Road Shows are coming to a city near you! Trimble will host a 7-city road show tour to showcase all the latest and greatest developments from Tekla Structures 2017. These events will bring together leading Tekla Structures users in the steel, construction and engineering industries for an information-packed day of educational sessions and enlightening discussions. Don’t miss your opportunity to network with your peers and members of the Tekla Structures support and development teams! With 7 different dates and venues, choose the time and place that’s best for you! The Tekla Salt Lake City Road Show will be held at the Doubletree Suites by Hilton Hotel Salt Lake City Downtown on May 18, 2017 from 9 am - 5 pm.